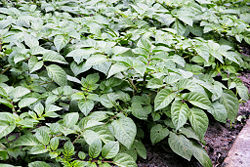 The potato plant (Solanum tuberosum) is a member of the Solanaceae, or nightshade, family, a family of flowering plants that also includes the eggplant, mandrake, deadly nightshade or belladonna, tobacco, tomato, and petunia. Its starchy tubers (stem thickened for use as a storage organ), called potatoes, are one of the world's most commonly grown and important food crops. Potatoes are the world's most widely grown tuber crop, and the fourth largest crop in terms of fresh produce (after rice, wheat, and maize), but this ranking is inflated due to the high water content of fresh potatoes relative to that of other crops. The potato is native to in the Andes, likely somewhere in present-day Peru or Bolivia, and spread to the rest of the world after European contact with the Americas in the late 1400s and early 1500s. Being easy to grow and having excellent nutritional value (although raw and wild potatoes have some toxicity concerns), the potato was the major staple crop of Ireland when the potato famine hit in the mid-nineteenth century, costing millions of lives. That crisis revealed some of the worse of human nature and misapplication of religious beliefs. Some Irish Catholics simply accepted their fate as divine providence. On the other hand, some Protestants considered it punishment brought on by the Catholics for practicing a flawed religion—even requiring starving families to convert to Protestantism before they would be given food, thus ignoring Jesus' dictum to love one's enemy and the religious principle of living for the sake of others. The sweet potato (Ipomoea batatas) is another crop plant with large, starchy, tubers (from roots), but is only distantly related to the potato (Solanum tuberosum). Although the sweet potato is sometimes known as yam in the United States, it is unrelated to the botanical yam. The potato plant is an herbaceous perennial in that it lacks a woody stem and lives more than two years. It grows 90 to 100 centimeters (3 to 4 feet) tall and is covered with dark green leaves. The above-ground part of the plant dies each winter and regrows in spring. It flowers three to four weeks after sprouting. The flowers are white, pink, or purple with yellow stamens. After many years of cultivation, the potato has lost much of its ability to produce seeds. Only very rarely does a flower produce a fruit. These are called seed balls and look like small green tomatoes. Each contains up to three hundred seeds, which are sometimes planted in an effort to create new potato varieties. They should not be eaten as they have poisonous substances. The below-ground part of the potato plant continues to live after the above-ground part has died in winter. Food energy for the next year's growth, in the form of protein and starch, and also water is stored in tubers, called potatoes, which are rhizomes (modified stems) attached to the root system. They are covered by an outer skin called the periderm. Inside that is the cortex, which serves as a storage area for protein and starch. Inside that is the vascular ring that receives starch from the plant's leaves and stem. The starch moves out of the vascular ring to the parenchyma cells that surround it. These cells are the tuber's main storage areas for starch. The pith, which makes up the center of the tuber, is the main area for water storage. 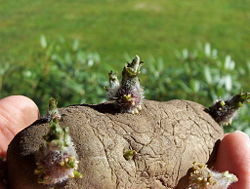 A potato plant grows anywhere from three to 20 tubers during its growing season. In the spring the tubers sprout and the above-ground plants grow anew. There are about two hundred species of wild potato. They all somewhat resemble the common potato, Solanum tuberosum, which does not grow in the wild. They are found only in the New World where they grow in Western South America from central Argentina and Chile, north through Mexico, and into the Southwestern United States. Peru has the largest number of wild potato species (Hijmans and Spooner 2001). Most potato species grow at high elevations in mountainous regions with hot summers and cold winters. It is likely that people have been digging up and eating wild potatoes for thousands of years. At some point, it was discovered that by replanting stored tubers a larger crop could be produced and potato cultivation began. This seems to have happened about 7,000 years ago in Southern Peru. 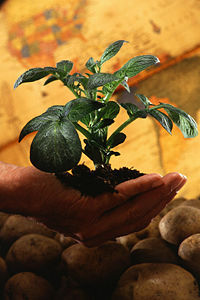 Besides Solanum tuberosum, six other species of potato are cultivated today in South America. Potatoes were an important part of the diet of the Incas and other peoples of Western South America. They were prepared in many ways, including being frozen and ground into flour. Hundreds of varieties of potatoes were, and still are, grown in South America. They are adapted for different growing conditions, some being grown at an elevation of 4,500 meters (15,000 feet). I do not believe that anyone knows how many varieties of potatoes there are in Peru, but to a person accustomed to out ordinary everyday “spuds," the display of potatoes in a Peruvian market is simply bewildering. 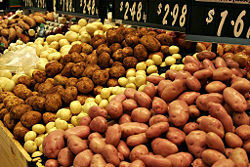 There are tubers with white, yellow, pink, gray and lavender "meat"; with skins white, pink, red, yellow, brown, green, purple, orange, black, and spotted and streaked with various hues; potatoes of every conceivable size and shape, some as smooth and shiny as a tomato, others as rough and warty as a toad. The first European record of the potato came in 1537 from the Spanish conquistador Castellanos, who discovered the tuber when his group raided a village in South America. After the potato was brought over to Spain, it gradually spread across Europe. Initially, the food was treated with distrust, and was believed to be unhealthy and even un-Christian. This prevented widespread acceptance for a period, although it began to be promoted as a medicinal plant. Popular legend has long credited Sir Walter Raleigh with first bringing the potato to England. History suggests Sir Francis Drake as a more likely candidate. In 1586, after battling the Spaniards in the Caribbean, Drake stopped at Cartagena in Colombia to collect provisions—including tobacco and potato tubers. Before returning to England, he stopped at Roanoke Island, where the first English settlers had attempted to set up a colony. The pioneers returned to England with Drake, along with the potatoes. Agriculturalists in Europe soon found potatoes easier to grow and cultivate than other staple crops, such as wheat and oats; potatoes produce more food energy than any other European crop for the same area of land and require only a shovel for harvesting. The potato became such an important food for the Irish that the popular imagination automatically associates the two today, but its early history in Ireland remains obscure. One speculation has it that the potato may have originally arrived in Ireland washed ashore from wrecked galleons of the Spanish Armada (1589). Another story credits the introduction of the potato in Ireland to Sir Walter Raleigh, a financier of transatlantic expeditions, at least one of which made landfall at Smerwick, County Kerry in October 1587. However, no record survives of what botanical specimens it may have carried or whether they thrived in Ireland. Some stories say that Raleigh first planted the potato on his estate near Cork. A 1699 source (over one century after the event) says, “The potato .... Was brought first out of Virginia by Sir Walter Raleigh, and he stopping at Ireland, some was planted there, where it thrived well and to good purpose, for in three succeeding wars, when all the corn above ground was destroyed, this supported them; for the soldiers, unless they had dug up all the ground where they grew, and almost sifted it, could not extirpate them” (Tomas 2003). Whatever the source, the potato became popular in Ireland both because of its high productivity and because of the advantages of both growth and storage hidden underground. English landlords also encouraged potato-growing by Irish tenants because they wanted to produce more wheat—if the Irish could survive on a crop that took less land, that would free a greater area for wheat production. By 1650, potatoes had become a staple food of Ireland, and they began to replace wheat as the major crop elsewhere in Europe, serving to feed both people and animals. A single devastating event, however, looms large in the Irish history of potatoes—the Irish potato famine. In the 1840s, a major outbreak of potato blight, a plant disease caused by a fungus, swept through Europe, wiping out the potato crop in many countries. The Irish working class lived largely on the unpalatable but fertile 'lumper,' and when the blight reached Ireland their main staple food disappeared. Though Ireland grew a variety of crops at this time, most went as exports to Europe for sale at a higher price. In fact, during the Potato Famine, Ireland remained a net exporter of foodstuffs, being that the exported foods remained too expensive for the Irish themselves to afford. Historians continue to debate the roles that English rule and European market prices played in causing the famine. The potato, which was a blessing to Ireland because of its nutritional value coupled with the fact that many potatoes could be grown on small areas of land, became a problem when the people became overly dependent on it, with a homogenous diet. Some misguided aspects of religion also played a role. Many of the Catholic Irish considered it the work of divine providence and just accepted their fate, and many of the non-Irish Protestants, particularly in England, as well as Irish Protestants, likewise considered it providence, caused by the Catholics for having a flawed religion. Some Protestants insisted on conversion prior to giving any food, even to those parents and children starving to death (Stitt 2006). Ultimately, the famine led to almost a million deaths, and the subsequent emigration of millions more Irish. Over 18 percent of the population of Ireland died in 1847 and almost 18 percent in 1849. Emigration from the German states also grew, although central Europe did not suffer the mass starvation that occurred in Ireland. By the seventeenth century, the potato had become firmly established as a staple of Europe's poor, leading richer people to spurn it. This changed gradually, with Antoine-Augustin Parmentier's persuading King Louis XVI of France of the value of the crop that he was fed as a prisoner of Prussia during the Seven Year's War. The soup potage Parmentier and shepherd's pie hachis Parmentier take their names from the great horticulturist. By the end of the eighteenth century, the potato had become popular in France due to the advocacy of Parmentier. Today, potatoes grow widely in Germany, Czech Republic, Poland, Russia, and other Northern or Eastern European nations, due to their ability to thrive in cold, damp climates. Potatoes figure in many national dishes of this region. Because the potato grew so well in Northern Europe, it may have contributed to the population explosion there in the nineteenth century. In Russia, potatoes met with initial suspicion: the people called them "the Devil's apples" because of folklore surrounding things that grow underground or that have associations with dirt. Although potatoes were called "potatoes of the Virginia" by early English botanists, they were in fact from South America, not Virginia. The first mention of potatoes in North America comes in an account of Scots-Irish settlers in Londonderry, New Hampshire during 1719. Potatoes were used for food and as animal feed. The first potatoes planted in Idaho were in 1836, but it was not until after the development by Luther Burbank of the Russet potato that potatoes became a major Idaho crop, at the beginning of the twentieth century. While potatoes are grown commercially in at least 35 states, most potatoes are grown in the north. Idaho grows 30 percent of the total U.S. potato crop, Washington state another 20 percent; Michigan, Wisconsin, North Dakota, Colorado, and Oregon round out the top producers. According to the Food and Agriculture Organization, the worldwide production of potatoes in 2005 was 322 million metric tons  which makes it the fifth highest production crop in the world. Potatoes are an important part of the diet in many countries, especially in Northern Europe and North America, and are featured in a number of their national dishes and most popular dishes. Potatoes are an excellent food providing carbohydrates, protein, vitamins (especially Vitamin C and Vitamin B6), and minerals (especially iron and potassium). Freshly harvested potatoes retain more vitamin C than stored potatoes. Potatoes contain almost no fat, and are low in calories. The skin of potatoes has dietary fiber and cooking potatoes in their skin tends to result in less leaching of vitamins and minerals. The potassium and magnesium content, with low sodium content, helps in keeping blood pressure low. Magnesium also helps to prevent tissue calcification and in overcoming formation of stones in the bladder. Potatoes (particularly mashed potatoes) are known to have a high Glycemic index (rate at which a food raises the blood sugar level), a disqualifying factor in many diets. New potatoes have a lower Glycemic index, as well as are higher in vitamin C.
New and fingerling potatoes offer the advantage that they contain fewer toxic chemicals. Such potatoes offer an excellent source of nutrition. Peeled, long-stored potatoes have less nutritional value, especially when fried, although they still have potassium and vitamin C.
Potatoes also provide starch, flour, alcohol dextrin (low-molecular-weight carbohydrates produced by the hydrolysis of starch), and livestock fodder. Potatoes contain glycoalkaloids, toxic compounds of which the most prevalent are solanine and chaconine. Cooking at high temperatures (over 170 °C or 340 °F) partly destroys these. The concentration of glycoalkaloid in wild potatoes and raw potatoes suffices to produce toxic effects in humans. Glycoalkaloids occur in the greatest concentrations just underneath the skin of the tuber, and they increase with age and exposure to light. Glycoalkaloids may cause headaches, diarrhea, and cramps. Those with susceptibility may also experience migraines, even from a small amount of potatoes. In severe cases of poisoning, coma and death can occur; however, poisoning from potatoes occurs very rarely. Light exposure also causes greening, thus giving a visual clue as to areas of the tuber that may have become more toxic; however, this does not provide a definitive guide, as greening and glycoalkaloid accumulation can occur independently of each other. Some varieties of potato contain greater glycoalkaloid concentrations than others; breeders developing new varieties test for this, and sometimes have to discard an otherwise promising cultivar. Breeders try to keep solanine levels below 0.2 mg/g (200 ppmw). However, when even these commercial varieties turn green, they can approach concentrations of solanine of 1 mg/g (1,000 ppmw). Some studies suggest that 200 mg of solanine can constitute a dangerous dose. This dose would require eating one average-sized spoiled potato or four to nine good potatoes (over 3 pounds or 1.4 kg) at one time. The National Toxicology Program suggests that the average American consumes 12.5 mg/person/day of solanine from potatoes. 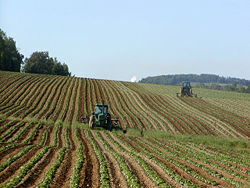 Dr. Douglas L. Holt, the State Extension Specialist for Food Safety at the University of Missouri - Columbia, notes that no reported cases of potato-source solanine poisoning have occurred in the U.S. in the last 50 years and most cases involved eating green potatoes or drinking potato-leaf tea. Solanine is also found in other plants, in particular the deadly nightshade. This poison affects the nervous system causing weakness and confusion. Hamilton, A., and D. Hamilton. 2004. Potatoes - Solanum tuberosums Retrieved May 4, 2005. Hijmans, R. J., and D. M. Spooner. 2001. Geographic distribution of wild potato species. American Journal of Botany 88: 2101-2112. Houghton, C. S. 1978. Green Immigrants; The Plants that Transformed America. New York, NY: Harcourt Brace Jovanovich. Salaman, R. N. 1985. The History and Social Influence of the Potato. Cambridge, UK: Cambridge University Press. Spooner, D.M., et al. 2005. A single domestication for potato based on multilocus amplified fragment length polymorphism genotyping. Proc. Natl. Acad. Sci. USA, Published online before print October 3, 2005. Verrill, A. H. 1937. Foods America Gave the World Boston, MA: L. C. Page & Company. Stitt, S. The roles and attitudes of Irish Protestants during the Potato Famine. Irquas Insight 2. Tomas, P. M. The potato in Irish history. This page was last modified on 27 May 2015, at 16:45.